The adaptive immune response was acquired by jawed vertebrates (or gnathostomata) more than 450 million years ago and is found in all extant jawed vertebrate species from fishes to humans. The adaptive immune response is characterized by a remarkable immune specificity and memory, which are the properties of the B and T cells owing to an extreme diversity of their antigen receptors . The specific antigen receptors comprise the immunoglobulins (IG) or antibodies of the B cells and plasmocytes , and the T cell receptors (TR) . The IG recognize antigens in their native (unprocessed) form, whereas the TR recognize processed antigens, which are presented as peptides by the highly polymorphic major histocompatibility (MH, in humans HLA for human leukocyte antigens) proteins. The potential antigen receptor repertoire of each individual is estimated to comprise about 2 x 10 different IG and TR, and the limiting factor is only the number of B and T cells that an organism is genetically programed to produce . This huge diversity results from the complex molecularsynthesis of the IG and TR chains and more particularly of their variable domains (V-DOMAIN) which, at their N-terminal end, recognize and bind the antigens [2, 3]. Molecular synthesis of the immunoglobulins (IG) or antibodies and origin of their diversity. The gene numbers are from the human (Homo sapiens) IGH, IGK and IGL loci. The figure illustrates the molecular mechanisms creating the diversity of the antigen receptors of the adaptive immune response. 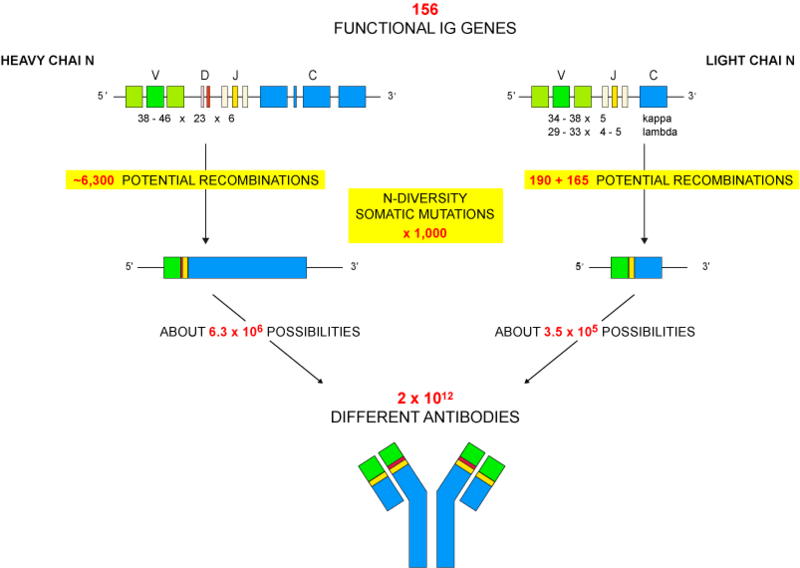 The huge number of 1012 different IG or antibodies per individual results from the combinatorial diversity (V-(D)-J rearrangements), the junctional diversity (N-diversity), the somatic hypermutations (SHM) and the pairing of the heavy and light chains. The IG and TR synthesis includes several diversity mechanisms that occur at the DNA level and are unique to the B and T cells. combinatorial V-D-J or V-J diversity created by the rearrangements of the variable (V), diversity (D) and joining (J) genes (about 6,300 potential V-D-J recombinations for the heavy chains and about 355 V-J potential recombinations for the light chains (190 for the kappa and 165 for the lambda, respectively) for the human IG, chosen as an example) (Figure). and later, during B cell differentiation, for the IG, somatic hypermutations (SHM) in the rearranged V-(D)-J genes. N-diversity during the V-(D)-J rearrangements (in bone marrow for the IG and in thymus for the TR) and IG somatic mutations in lymph nodes increase the diversity by a factor estimated to 1,000. During the transcription in B or T cells, the rearranged V-(D)-J gene which codes the V domain is spliced to a C gene that codes the C region. Altogether the mechanisms of diversity that occur at the DNA level in the B cell result in about 6.3 x 106 and about 3.5 x 106 possibilities of heavy and light chains, respectively, and the pairing of one heavy chain with one light chain (the antibody is made of two identical heavy and light chains) results into a potential repertoire of 2 x 1012 different antibodies. Lefranc M-P. Immunoglobulin (IG) and T cell receptor genes (TR): IMGT® and the birth and rise of immunoinformatics. Front Immunol. 2014 Feb 05;5:22. doi: 10.3389/fimmu.2014.00022. Open access. PMID: 24600447 LIGM:429. Lefranc, M.-P. and Lefranc, G. The Immunoglobulin FactsBook . Academic Press, London, UK (458 pages), 2001. Lefranc, M.-P. and Lefranc, G. The T cell receptor FactsBook. Academic Press, London, UK (398 pages), 2001.